The fruit peel of pomegranate (Punica granatum L.) contains high concentrations of polyphenols, which play a critical role in determining the color and nutritional value of fruits. 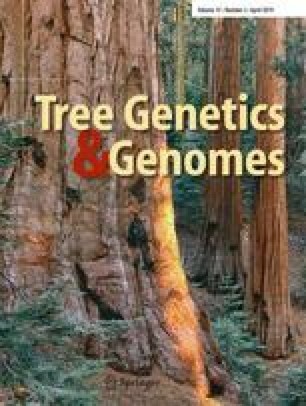 This study evaluated and compared the production of two major classes of polyphenols in the pomegranate fruit skin, i.e., anthocyanins, the main pigments in pomegranate, and punicalagin, a highly bioactive hydrolyzable tannin that is synthesized from an intermediate of the shikimate pathway. Gene expression and metabolite (anthocyanins and punicalagin) accumulation were determined, at three stages of fruit development, in the peel of red and pink cultivars, containing high and low levels of anthocyanins, respectively. Red and pink pomegranate cultivars showed the highest difference in gene expression during the transition from early to late fruit developmental stages, while differences between the cultivars were relatively small at each developmental stage. Positive correlations were found between anthocyanin and total punicalagin content. Of the differentially expressed contigs, 3093 and 312 contigs were correlated (Pearson’s r, |0.75|; P < = 0.02) with anthocyanins and punicalagin content, respectively. Interestingly, 143 contigs positively correlated with both anthocyanin and punicalagin. The differentially expressed contigs could be further divided into five groups representing a distinct characteristic correlation with each of the analyzed metabolites. Overall, the presented information provides a comprehensive view of the interplay between the hydrolyzable tannin and the anthocyanin pathways and points to genetic factors potentially involved in this interaction. The online version of this article ( https://doi.org/10.1007/s11295-019-1329-6) contains supplementary material, which is available to authorized users. We thank Kamel Hatib for orchard management. The raw sequencing data is archived in NCBI No. PRJNA521857. RHB and DH conducted the study and wrote the manuscript, DH LT and RA initiated the study, RHB and IBY collected and prepared the plant material, RH and RA did the punicalagin analysis, HBN did the AT analysis, TT purified the RNA, and SF, TL, ADF, and RO did the bioinformatics analysis. This research was supported by research grant award No. IS-4822-15 R from BARD, The United States—Israel Binational Agricultural Research and Development Fund.